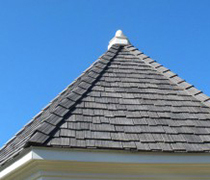 Enviroshake Inc. has developed a superior composite blend and formulation that is used to create the company’s signature roofing product, the Enviroshake, which looks like a natural silvered cedar shake. It is a durable and attractive premium quality roofing product which is the only composite that authentically resembles the cedar shake. The Enviroshake product has been used in high profile new construction and renovation projects and is available across Canada and the U.S. and can be purchased exclusively through Certified Installers to maintain the highest level of installation quality. Enviroshake® is a composite “high-tech” roofing material that replicates the look of a weathered #1 grade taper-split cedar shake, but has the added benefit of performance and durability associated with its composition. • The only roof that gets better looking with age!